The Picasso Rhino head was designed with the collaboration of Bassmaster Elite Series Pro Aaron Martens to bring you a "shakey" style head that's at the top of the class in design and function. 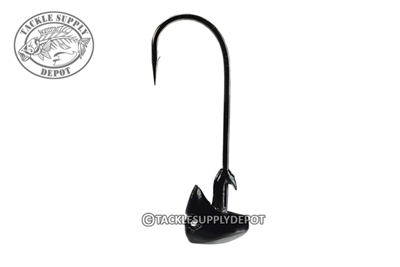 Featuring a Rhino horn that not only protects your soft plastic from being pulled down but also designed to slide easily thorough a fish's mouth for quick hook penetration. The weight-forward design allows the bait to stand and creates a unique action that fish find irresistible. The hook eye is constricted so the knot cannot slip up or down the eye of the super-sharp 2X-strong Gamakatsu hook, and also creates a cam-action which forces the hook into their mouths. The design of the Rhino Head dramatically increases knot longevity. Hard Pro Metal alloy for extra sensitivity and Picasso's chip-resistant Duraseal coating round out the features of this head. "Note: the Gamakatsu hooks on this product run smaller. 3/0 is equivalent to 2/0, 4/0 equivalent to 3/0."